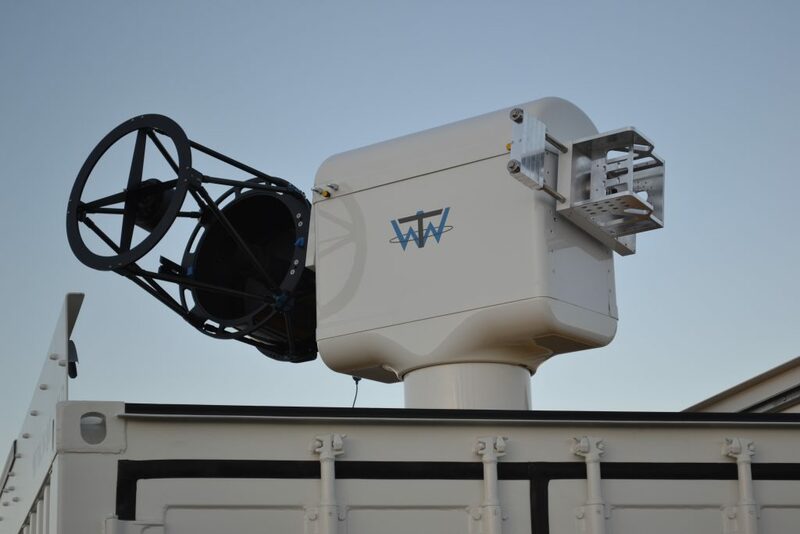 WTW’s mobile Satellite Laser Ranging (SLR) System integrated in a 20ft Container.. 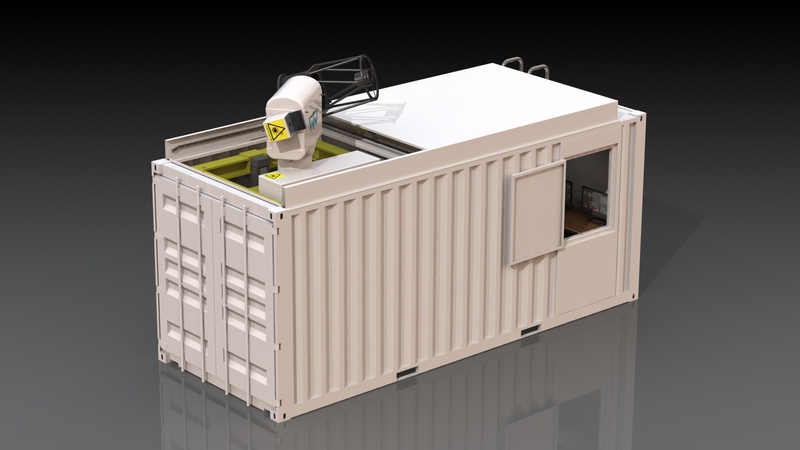 It is a 20ft standard container with an electrical sliding roof on top of the telescope section. The Control room section is about 3.5m x 2.3m with 3 work places. The control room has an air condition . When the sliding roof is closed, the air circulates between control and telescope room. If the sliding roof is opened, the circulation is stopped. Only when the sliding roof is opened, the lifting segment with the telescope can be driven out to move the telescope over the roof level. 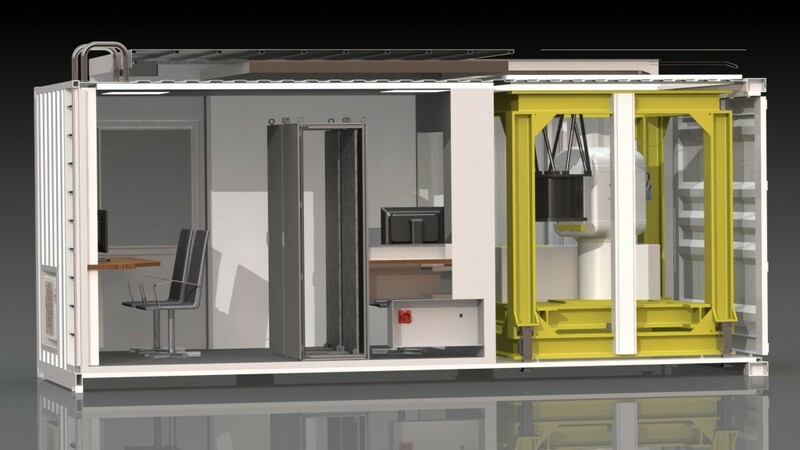 But before that the complete lifting frame move of the container floor by 4 electric lifter to level it out and disconnect it from the container (the lifters are driving through holes in the container floor to the ground). 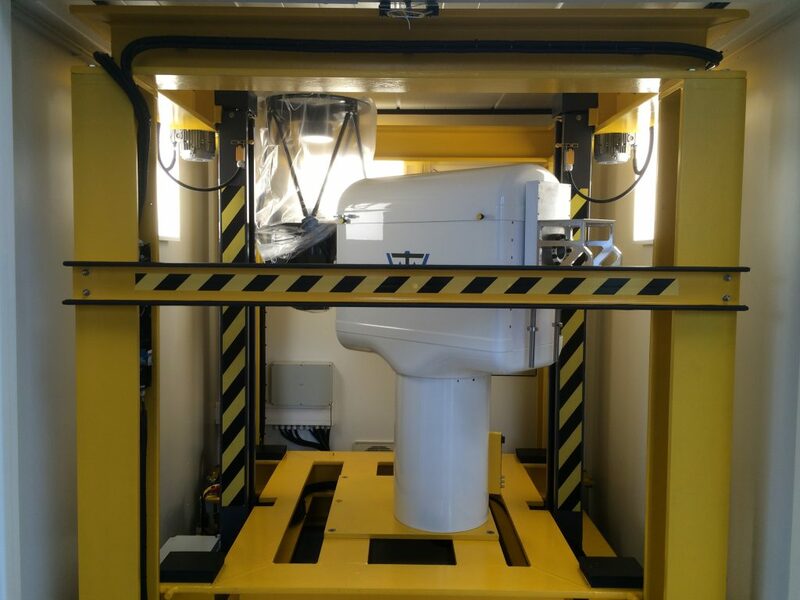 The lifting frame has a weight of about 3t to give a massive foundation for the telescope. The internal construction is a massive aluminum frame to give high stiffness. Both direct drives are big hollow shaft servo drives with a rated torque of 100 Nm (max. 250 Nm). The inner diameter of the hollow shaft is 100mm. In addition to the internal encoders we are using external absolute encoders with a 26bit resolution on both motors. The absolute encoders are directly connected to the motors. That gives us the high accuracy. For the unlimited rotation in azimuth we are using a slipring assembly also with a hollow shaft and inner diameter of 50mm. This is the diameter of the coude’ path that could be used for a Laser. “Satellite Laser Ranging (SLR) is a proven geodetic technique with significant potential for important contributions to scientific studies of the Earth/Atmosphere/Oceans system. It is the most accurate technique currently available to determine the geocentric position of an Earth satellite, allowing for the precise calibration of radar altimeters and separation of long-term instrumentation drift from secular changes in ocean topography. 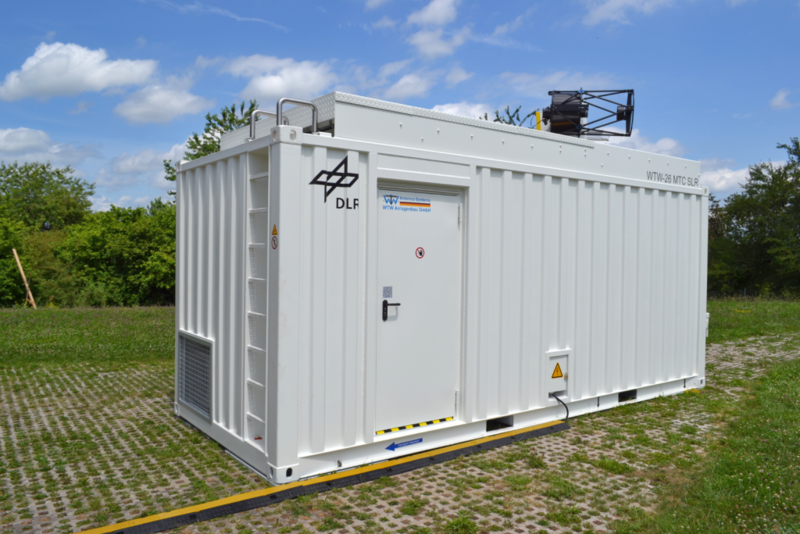 – monitoring the response of the atmosphere to seasonal variations in solar heating.